LONDON, UK, 2018-Oct-31 — /Travel PR News/ — Autograph Collection Hotels, part of Marriott International, today (10/29/2018) announced the much anticipated opening of Bankside, a new design-forward hotel on the south bank of the River Thames. Situated in the heart of one of London’s most dynamic neighbourhoods, just a stone’s throw away from Tate Modern, British Film Institute and Borough Market, the 161-room boutique hotel joins the diverse and dynamic portfolio of more than 150 Autograph Collection Hotels around the world that are independent, one-of-a-kind and champion values of vision, design and craft. Inspired by the art of craft, Ms. Lee commissioned British craftsmen to create key features that reside in the hotel and pay homage to its British heritage, including Laura Carlin, a ceramicist and illustrator from London, who has provided two wall murals composed of illustrated tiles that bring to life the cultural narratives of the South Bank and Malgorzata Bany a London-based artist and designer who has created a series of tables. In addition to showcasing the vibrant locale through the hotel’s inspired interiors, Bankside features a neighbourhood restaurant and bar. Head Chef Lee Streeton, formerly of 45 Jermyn Street, will lead Art|Yard, an informal design-focused all-day restaurant with its menu celebrating seasonal British produce with European influences, alongside classic cocktails, local beers and an unexpected selection of wines. Reflecting the hotel’s commitment to the creative area in which it resides, Bankside has partnered with Contemporary Collective to run a rolling Maker in Residence programme. This permanent space offers emerging artists the opportunity to showcase and create work just a stone’s throw from the Tate Modern. Located on the ground floor of the hotel with direct access onto a communal courtyard space, the Makers hub will be a dynamic new addition to the vibrant Bankside art scene. A schedule of rotating makers, a series of talks, previews and events throughout the year will offer resident guests and passers-by new experiences with each visit. The first Makers in Residence will be London-based urban landscape painters Luke M Walker and Andrea Tyrimos, who are collaborating for the first time. Walker, a contemporary artist and interior spatial designer, holds a Master of Arts from City and Guilds of London Art School while street art inspired Tyrimos graduated from Central Saint Martins with a B.A. in Fine Art. Both use art to raise awareness about environmental issues. Contemporary Collective, who will manage and curate the space, are an emerging online gallery founded in 2006 by Elinor Olisa and Isobel Beauchamp with a mission to champion the careers of emerging and newly established artists internationally, allowing collectors inside access into the most promising talent that exists today. Bankside has also commissioned three pieces from Helen Gorrill, a portrait artist represented by The Contemporary Collective, to create three portraits of iconic people who have had a connection to the area. Opening rates at Bankside start from £290 on a B&B basis and include VAT. Visit www.banksidehotel.com or www.autographcollection.com for more information. Bankside is a design-led hotel on the south bank of the River Thames. 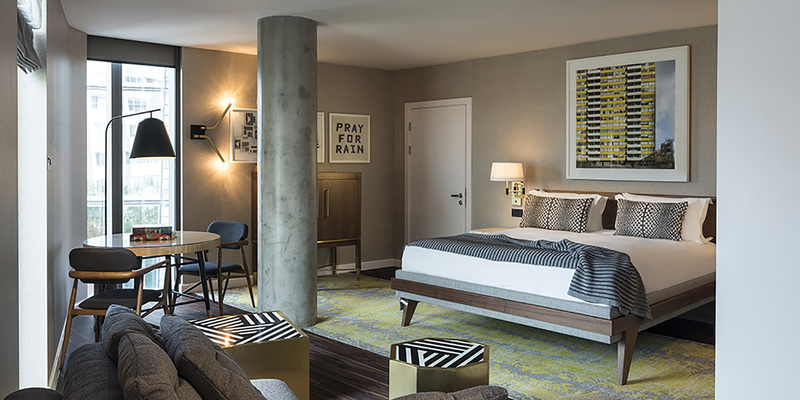 Situated in one of the Capital’s most creative and dynamic neighbourhoods, just minutes from the City, the hotel features modern mid-century interiors with subtle connections to the artistic heritage of its surroundings. In addition to 161 airy-residential style rooms, Bankside will offer a creative space with live-work lounges, ‘white cube’ gallery space, and a restaurant and bar with outdoor terrace serving a relaxed seasonal menu. Co-working and inspiring meeting spaces will blend the latest technology with contemporary and flexible environments. Bankside is part of the One Blackfriars development from award-winning architect Ian Simpson. This entry was posted in Business, Hotels, Luxury, Resorts, Travel, Travelers and tagged Autograph Collection Hotels, Bankside, Dayna Lee, hotel, John Licence, London, Marriott International. Bookmark the permalink.